It's OK, you can admit it. You didn't go to the dentist last year. The number of working-age adults getting dental care has been declining, according to the American Dental Association. But what if the hygienist came to you? 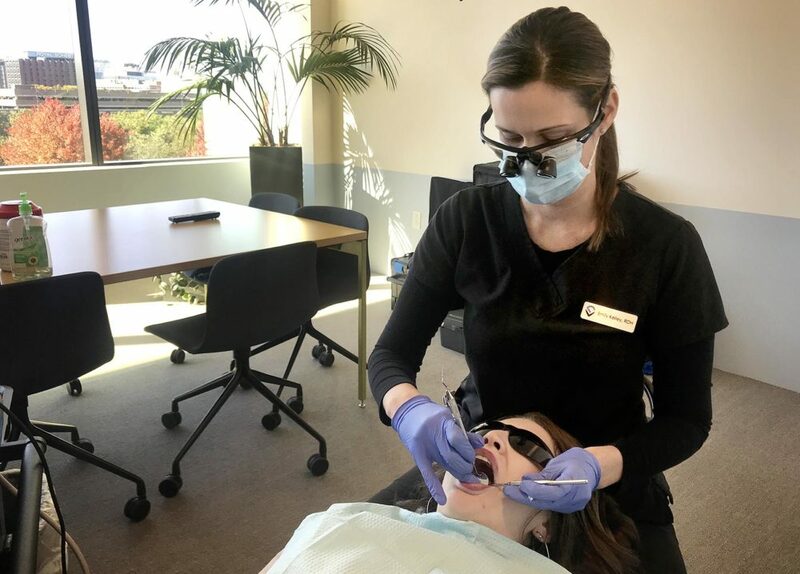 Virtudent, a Massachusetts-based startup, is working with employers to set up remote dental services inside empty office space. "Yes, we're in a conference room," says Virtudent's Debbie Kenny. "Because that's where we find it's easy for people to take care of their oral health." Kenny set up shop with two hygienists on a recent afternoon in the sunny headquarters of EF Education First, a company that promotes travel and cultural education. Employee Maria DeLorezno took a break from work to get her teeth cleaned. She sits back in a portable dental chair with a splendid view of Boston's skyline. "I moved to Boston a year and a half ago from southern Maine, and my dentist office is still there," she said, eyes fixed on the ceiling. "Rather than try to find someone for the annual checkups, it's easier to do it here." DeLorenzo's insurance will cover the checkup. If there's any issues during the visit her hygienist can call up a dentist through the computer at the workstation. A doctor will review any images of her mouth taken at the appointment. For someone who usually made it to the dentist once a year, "now I go twice," she says. That's exactly the point. Just 36 percent of people between 19 and 64 visited the dentist in 2014, according to the American Dental Association. Virtudent CEO and founder Hitesh Tolani says remote dentistry can help narrow what the industry calls its "busyness problem." "Dentists are having empty chairs," he says. People cite cost as one reason they skip the dentist. They also tend not to go unless it's an emergency — when something in their mouth hurts. Another factor is convenience. "People are consuming their lives through technology and on-demand services. They're busy. And as a doctor, my job is to try to help you get care," Tolani says. "We try to make it easy." 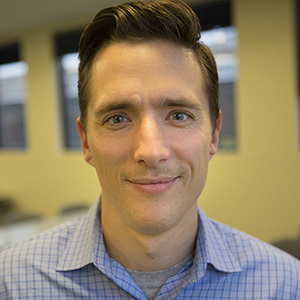 Virtudent serves people at large companies and small startups, and uses the revenue to set up remote clinics for low-income children. "The concept of an organization that would create dental services at the location of an employer does make sense and we are seeing several examples of those emerging across the United States," says Maryland-based dental consultant Roger Levin. He calls the dentist-at-work model "a niche," but one that isn't going away. He also says it demonstrates just one of the seismic changes the industry has undergone in recent years. 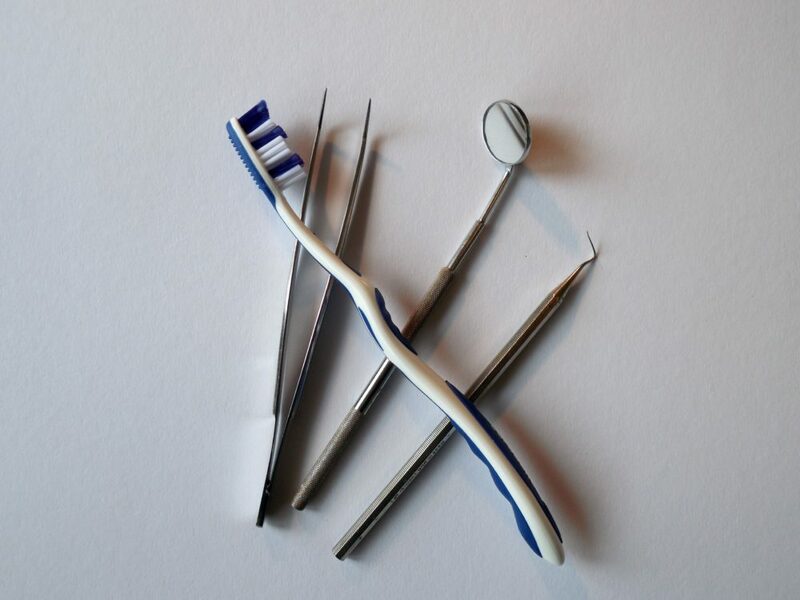 "Dentistry is going through a true metamorphosis of different delivery models," he says. One of those changes accelerated in 2008 when private equity swooped in to rescue troubled practices during the financial crisis. It helped lead to the rise of dental support organizations, or DSOs. Levin calls it "corporate dentistry," and he estimates 20 percent of dentists now get their paycheck from a corporate owner. Huge debt loads for young dentists fresh out of school also make the traditional private-practice model more unattainable. It's this sort of upheaval that has dentists rethinking the way they do business. But companies like Virtudent are also taking note of a broader trend in the American economy. In a tight job market, employers are competing for workers. It's not enough anymore to reward young, skilled employees with regular paycheck. EF North America CEO Edward Hult says he brings perks like teeth cleaning to his conference rooms to boost his company's culture. "We try to help out as much as we can to make sure all our staff are both happy and healthy," Hult says. At EF you can even get your haircut at work. "Eye exams, flu shots, being able to cut your hair," Hult says. "That part is about stress management and just saving time."